There has been no shortage of “staying in is the new going out” headlines since the recession hit last year, usually applied to statistics about fewer people going to pubs, a rise in subscriptions to online DVD rental services or a surge in sales of board games. Not surprisingly, restaurants have been particularly badly hit, with a number of high‐profile cases in Ireland. But we haven’t really enjoyed going out to eat for a number of years now. Eating out in Ireland is notoriously expensive, and there’s nothing I hate more than a mediocre meal that costs nearly as much as a week’s worth of groceries and that I could make just as well or better myself. So when Matt asked me if I wanted to go out to dinner for my birthday yesterday, I said I’d rather splash out on some good‐quality ingredients and make a nice dinner at home instead. And even though he kept offering to get me my favorite cake from a local patisserie or make me a birthday cake if I just gave him the recipe I wanted, I happily insisted on making it myself, since I’ve been looking forward to trying this buttermilk cake recipe since Deb at Smitten Kitchen posted it in July. 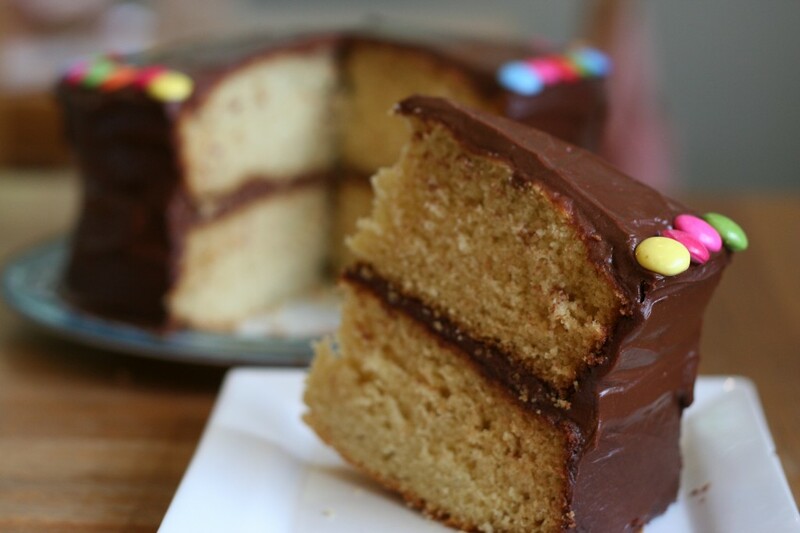 I’ll definitely make it again as my go‐to recipe now for a yellow cake or easy chocolate frosting, but I have to admit that it didn’t unseat Beatty’s chocolate cake as my favorite. Still, it’s good to try new things (especially cakes). Preheat the oven to 425°F (220°C). Place six 6‐inch round gratin dishes on a sheet pan. To make the topping, place the butter in the bowl of an electric mixer fitted with the paddle attachment (you can also use a hand mixer). With the mixer on low speed, add the garlic, shallot, Parma ham or pancetta, parsley, lemon juice, Pernod, salt, and pepper and mix until combined. With the mixer still on low, add the olive oil slowly as though making mayonnaise, until combined. Fold the panko or breadcrumbs in with a rubber spatula and set aside. Place 1 tablespoon of the wine in the bottom of each gratin dish. With a small sharp knife, remove the white muscle and membrane from the side of each scallop and discard. Pat the scallops dry with paper towels and distribute them among the 3 dishes. Spoon the garlic butter evenly over the top of the scallops. Bake for 10 to 12 minutes, until the topping is golden and sizzling and the scallops are barely done. If you want the top crustier, place the dishes under the broiler for 2 minutes, until browned. Finish with a squeeze of fresh lemon juice and a sprinkling of chopped parsley and serve immediately with plain crusty French bread to soak up all the amazing juices. Sift together the flour, baking powder, baking soda, and salt in a medium bowl. Cream the butter and sugar together in a large bowl with an electric mixer at medium speed until pale and fluffy, then beat in the vanilla. Add the eggs one at a time, beating well and scraping down the bowl after each addition. At low speed, beat in the buttermilk until just combined (the mixture will look curdled, but don’t worry). Add the flour mixture in three batches, mixing until each addition is just incorporated (don’t overmix). Spread the batter evenly in the two cake pans, then rap the pans on the counter several times to eliminate air bubbles. Bake until golden and a wooden pick inserted in center of cake comes out clean, 35 to 40 minutes. Cool in the pan on a rack for 10 minutes, then run a knife around the edge of the pan. Invert onto the rack and discard the parchment, then cool completely, about 1 hour. Combine the chocolate and espresso powder, if using, in the top of a double‐boiler or in a heatproof bowl over simmering water. Stir until the chocolate is melted. (Alternately, you can melt the chocolate in a microwave for 30 seconds, stirring well, and then heating in 15 second increments, stirring between each, until the chocolate is melted.) Remove from the heat and let the chocolate cool until tepid. Whisk together the sour cream, 1/4 cup (60 ml) of the corn syrup (or golden syrup) and vanilla extract until combined. Slwoly add the tepid chocolate and stir quickly until the mixture is uniform. Taste for sweetness, and if needed, add additional corn syrup (or golden syrup) in one‐tablespoon increments until the desired level of sweetness is achieved. Let the frosting cool in the refrigerator until it’s a spreadable consistency, about 30 minutes. Should the frosting become too thick or stiff, just leave it out until it softens again.